Obituary for Donald John VanHoe | Langeland Family Funeral Homes, Inc. Passed away peacefully surrounded by his loving family, on Monday, March 12, 2018, following a short illness. Age 91. Donald was born in Kalamazoo on September 12, 1926, the son of the late Harry VanHoe and Wilhelmina Eblink. As a young man he had worked for his grandfather in the celery fields. He served his country in the United States Army during World War II. 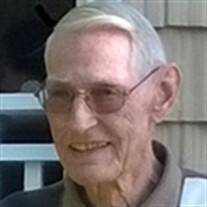 He loved going to work and retired from Michigan Bell/Lucent Technologies after thirty eight years of service and also had worked for Upjohn. He was a member of Southern Heights Church for over fifty years. He was united in marriage with Loretta (VanderRoest) VanHoe on September 5, 1952; she preceded him in death in 1991. Together they raised a wonderful family. The family had lived in Florida for six years and enjoyed family vacations, especially going back to Forida. Donald loved his family and was selfless in taking care of any of his family's needs and projects. He lived an active lifestyle and enjoyed gardening, walking and bike riding. He is survived by four children, Donald (Debbie) VanHoe, Daniel (Sandra) VanHoe, Jill (Michael) Doman and Lisa VanHoe; grandchildren: Jennifer Beth (Troy) Sutton, twin granddaughters, April Loretta (Nathan) Jepkema & Brandi Lynn (Andrew) Martin, Aimee Lynn (Mark) Garrison, Lisa Anne (Nick) Mathisen, Tina Kimberly (Tommy) Stephens, Dayna Jill Doman and Justin Michael Doman; eleven great-grandchildren; brother-in-law and sister-in-law, Betty and Henry DeVries. Donald was preceded in death by his siblings, Harold VanHoe, Lucille Voss, Frances VanHoe and Lois Johnson. A private interment took place in Mt. Ever-Rest Memorial Park, South. The family will receive friends from 10 a.m. - 11 a.m. on Monday, March 19, 2018 at Southern Heights Church, 4141 East Hillandale Dr., Kalamazoo, MI 49008, where the memorial service will follow at 11 a.m. Pastor Dan Sarkipato will officiate the service. In lieu of flowers, memorial contributions may be given to Southern Heights Church. Arrangements by Langeland Family Funeral Homes, Memorial Chapel.